So, its a good habit to create DB backup on routine basis. If you’r using wordpress plateform, install any automatic backup creating plugin such as iThemesSecurity. However, database is use for restoring your website, transferring your site from one host to another host or if you are going to change your domain name. mysql database is the place where all the posts, comments, pages, users login details and other data are stored. 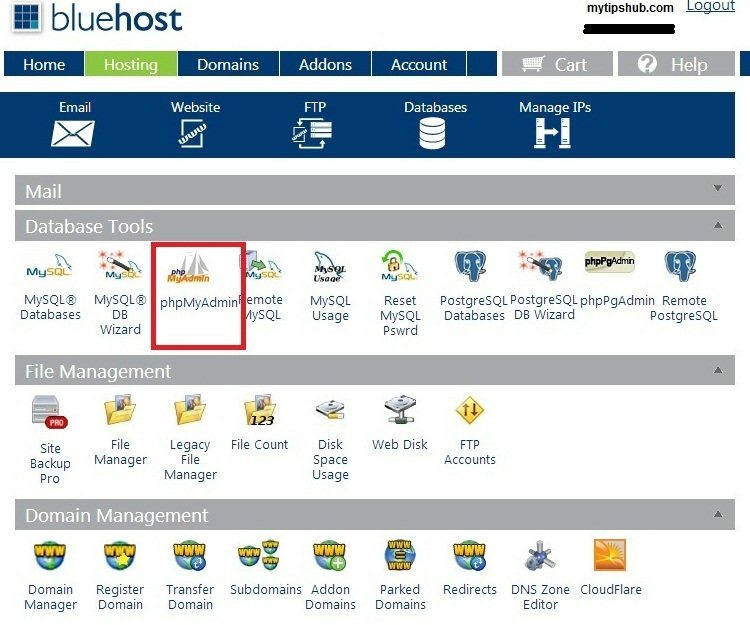 How to Backup MySQL Database with phpMyAdmin? Login with your username and password confidential’s, after login go to Database Tools. Find phpMyAdmin icon near mysql database under Database Tools tab. Click on phpMyAdmin after that phpMyAdmin panel will say you to re-enter your web hosting username & password again, enter your confidentials and hit the enter key. Now your database tables are shown, if you have only one mysql database then tables are directly shown. But if you have more than one DB’s then you need to click on specific one to see tables within it and also can create backup. In my case, I have created some DB’s for demo purpose to guide you more deeply. I have created two DB’s and I want to create the backup of MyTipsHub mysql database, so I need to click it. Tables within MyTipsHub will be appear, just find and click on Export button located on the Top. Here are two options for creating backup. If your database size is small, select quick option then click on Go button and db backup procedure will be start immediately, your backup file extension will be something like .sql. But if DB size is huge you can create backup in zip format, for this you need to click on Custom – display all possible options. Here is you just select the backup file format and leave all other options as default, click on Go button. After few seconds a download notification will be appear, click on download or start. Congratulation’s! you have successfully backup your mysql database.